I’ve been knee deep in a handful of games you’ve already seen me blather about, but there’s one new release I’ve been fiddling with that I think is worth mentioning. 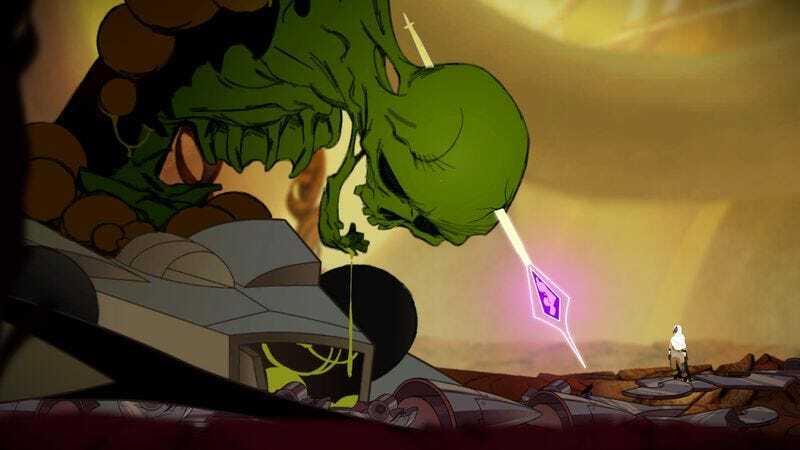 Coming off a very successful Kickstarter for the game, the studio named Thunder Lotus has launched its second project, Sundered, for PlayStation 4 and PC. This is the follow-up to its Norse action-RPG Jotun, which made some waves in 2015 thanks to gorgeous art and animation. Sundered is every bit as beautiful, an arduous march through a world of ruined technology and eldritch horrors brought to life with a dark, hand-drawn style. It’s a Lovecraftian hellscape by way of ’50s Disney, and it’s incredible in motion. It’s a lot less incredible to play. The game is a Metroid-style platformer at heart, with a world that unfurls as you gain new abilities and open shortcuts. Your exploration is frequently hindered by hordes of robotic enemies—emphasis on the word hordes. You’ll be chugging along, heading toward some marker on your map that you don’t understand, and seemingly at random, tons of enemies will start pouring into the screen. Your character is nimble enough to avoid many of the attacks, but at a point, there comes to be so much flying at you that it’s near impossible to dodge it all and fight back at the same time. If you die, and you probably will, a lot, you don’t lose anything but your progress through the map. You start back at the beginning of the game, where you can spend the experience points you‘ve earned to upgrade your character, and then you’re right back in it, hoping Sundered is merciful enough to finally let you get closer to whatever you were seeking. It seems more sadistic and unfair than it does meaningfully punishing, but I’m intrigued enough to see if it manages to cross back over to the more reasonable side of that divide. Board games are sort of like liquor: You need a different kind depending on the occasion. Beer for a picnic, wine for a nice dinner, cocktails for a party. At my house board games are tailored for the occasion, too. My partner and I can set aside three hours to go deep into A Few Acres Of Snow, but that wouldn’t be appropriate for a casual game with someone not especially into the board game world. Codenames is perfect for large gatherings, especially when people are already intoxicated, but it’s not a rainy-afternoon game you can cozy into. Lords Of Waterdeep is the ideal for when you have friends over who are either novice or moderate board game players. Its rules are easy to learn (gather supplies you need to complete tasks) and beginner strategy can be explained in one sentence (focus on your character’s game-end bonus function). But the mechanics that seem so simple on their face are interesting enough to keep me invested, even though I’ve played it dozens and dozens of times. Plus, playing a game for the first time always takes longer than it does on subsequent plays, but Lords Of Waterdeep’s set rounds help keep games brisk. But what I like best about Lords Of Waterdeep is that you never know who’s going to win. Characters get different bonuses at the very end of the game for types of tasks completed, and these last-minute points have the ability to put someone who lagged in last the whole game at the front of the pack. There’s also flavor text that we insist players read out loud, and this text runs the spectrum from in keeping with a basic fantasy tradition to very random to downright goofy. The game comes from the same people who make Dungeons & Dragons, but you don’t need to play D&D—or even be familiar with it in the least—to enjoy Lords Of Waterdeep. As a member of a board-game-loving couple, “What do we play tonight?” is a constant struggle for me and my S.O. to overcome on a lazy night in. So many great modern board games—strategy-heavy stuff like Caitlin’s pick, deception-based games like Werewolf or Revolution, or a personal favorite, 7 Wonders—all require three or more people for optimal play. (And heaven help you if you get stuck trying to make the best of it with janky two-player rule variants that have been grudgingly slapped on at a later date.) That’s why the 2015 7 Wonders spin-off game, Duel, has been such a breath of fresh air for us. I’ve never seen a game so cleverly compress its mechanics down to two-player interaction, whether it’s by adding a nasty resource-denial element to the game’s trading system, or by taking 7 Wonders’ most basic interaction—passing stacks of cards around the table, selecting one at a time—and turning it into a competitively elegant two-person version of Solitaire. Best of all, it’s freed us from the tyranny of playing yet another game of Dominion or Lost Cities every single night for the rest of our lives (great and replayable as those games are).